Lil' Inker: My First Publication! Hiya!!! I thought I would stop by and share the very first published card!!! It was published in Paper Crafts Magazine's special issue Holiday Cards & More, Vol. 6 and you can see it on page 49! What's even cooler is that this project features the very first product (Sentiment Flags Die) I released through Lil' Inker Designs. So now LID is published!!! YAHOO!! I used my Sentiment Flags Die to create this fun, felt tree and it's actually VERY easy to do. Here are some helpful instructions so you can make your own! Die cut five flags from felt. For the bottom, largest branch, stack two flags and hot glue the ends together. Open up your branch and tie the center with twine. Repeat steps for middle branch making it shorter than the bottom branch for a tiered look. For top branch, fold last flag in half and cut *v* shape on opposite end. Tie center with twine. Glue each branch to a cork covered Popsicle stick as shown. Cut out star. Add twine and button embellishment and affix to top of tree as shown. This would even make an adorable ornament for your tree, don't you think? 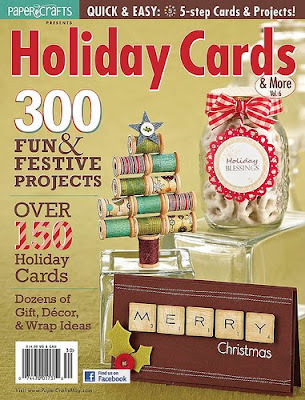 This is an AMAZING issue jammed packed with inspiring projects for the Holidays. You must add it to your collection! You can purchase your copy HERE! Cardstock: (Kraft) Papertrey Ink, (So Saffron) Stampin’ Up! super ginormous congrats...your card is amazing! Congratulations!! Your card is so cute & clever! Congrats, Laura! Love your clever and creative use of the sentiment flag die. WOW!! Congrats, Laura. What a fun feeling that must be to see your creation published! HUGS! Woohoo! Don't forget about that big Stamping Royalty spot in the September/October issue too. 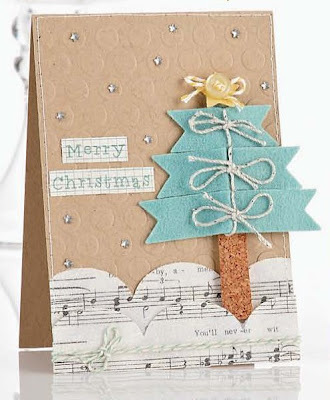 I love all the texture in the card -- what a great way to showcase Lil' Inker *and* your talents. Congrats, Laura....your card is FABULOUS!!!! !